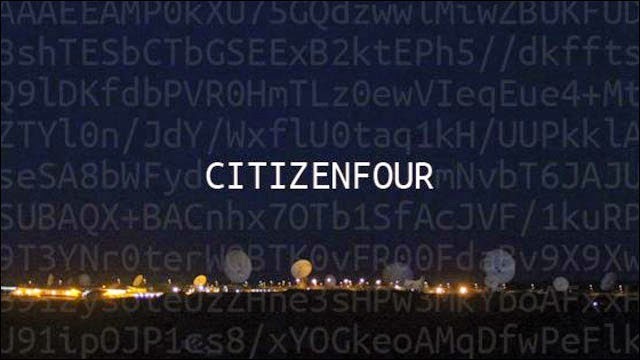 The crux of "Citizenfour" is the clandestine meeting in June of 2013 between the film's director Laura Poitras, Guardian journalists Glenn Greenwald and Ewen MacAskill and Edward Snowden, leaker extraordinaire, most famous whistleblower to roam the earth, in which he provided comprehensive details on the cloak and dagger spy program being conducted by the NSA (National Security Agency) as a purported means to protect our civil liberties that formed the explosive bits of journalism metaphorically tearing the roof off the US Capital rotunda. Aesthetically, "Citizenfour" is fairly elementary, because when the subject of your film is forced to communicate either by spectacular email encryption or strictly covert face-to-face encounters it prevents scenic "60 Minutes"-ish walk and talks. No, if on the precipice of becoming the Obama Administration's Public Enemy #1 you're holed up for days at a time in a non-descript Hong Kong hotel with the curtains drawn. Those curtains, however, allow for one of Poitras’s unfussy artistic flourishes, specifically a shot of Snowden standing behind them and peering out at the packed streets below after just being told – in the film's most hysterical line – that the street housing the apartment he has been forced to flee is suddenly jam-packed with construction vans. The shot, I reckon, must have been staged, but so what if it was? That's who he is in this context, a man providing not merely a peek behind the governmental curtain but ripping it off its hooks and casting it aside. Naturally that has led to labels of both patriot and pariah, and President Obama is seen on camera in archival footage essentially agreeing with the latter claim by rejecting the first claim, never mind that Sam Adams, the O.A.P. (Original American Patriot), was seen as a pariah by King George III. Did that last sentence expose my biases? Of course it did! "Citizenfour" slants in favor of Snowden, because to acquire access to him it had to, and seeing as how the information he discloses on camera is the same information we all have already read and discussed and considered it is nigh impossible to enter the movie theater not having already made up one's mind about his actions, as evidenced by the two women at my screening who kept chiming in with audible hoots and hollers of support for Mr. Snowden that would not have been out of place at any old propagandistic-themed evening out. But as Greenwald himself said at the film's New York Festival premiere: "I always thought that the most powerful part of the story was not going to be the documents or the revelations, as important as those are. It was going to be the power of his story, the acts of this very ordinary young man who decided very consciously to sacrifice his whole life for a political principle." Snowden's repeated assertion that the secrets he's divulging be the focal point rather than himself becomes wishful thinking. As Greenwald's quote suggests, it is not only virtually impossible for the person telling the story not to become the focal point, but that "Citizenfour's" overriding intent is to put a personality to the face of its title. And even if Poitras pairs a news anchor remarking how the entire episode evokes a John le Carré novel with a shot of Snowden as he trims his facial hair, trades his glasses for contacts and gels up his hair in an effort to evade detection after his name goes public, his personality comes across as the diametric opposite of any kind of international man of mystery. The soul-searching he undoubtedly underwent about what such an act would and does bring about happened long before Poitras’s camera rolled. Nevertheless, Snowden's genuine matter-of-factness in approaching these earth-rattling developments is affecting, and all evidence on screen suggests he did what he did simply because he thought it was the necessary thing to do. Of course, the obvious irony is that by exposing our country's compromising of personal freedom, he more or less forfeited all of his own, doomed to exile, to airport terminals to avoid extradition, and all at the expense of loved ones (though it is revealed his longtime girlfriend eventually re-connects with him). And while the film makes clear his sacrifice has inspired others to potentially blow the whistle, it still ultimately plays less like a hymn of exaltation than a pained elegy for what seems, frankly, an inevitable future ending. This is a film made most haunting by what it really is - cinematic life insurance. Filmmaker Laura Poitras paints a frankly terrifying picture of the loss of liberty involved in the widespread government gathering of the communication done by ordinary Joes on a daily basis.